Harvard Model Congress is still a relatively new club at Rockland High School but it has already developed a great deal of interest among students. This year, RHS’s Harvard Model Congress advisors, Richard MacAllister and Amanda Lanigan, took 18 students to a three night, four day conference at the Boston Sheraton Hotel during February Break (Thursday, Feb. 18 to Sunday, Feb. 21). Harvard Model Congress, the “largest government simulation conference in the world,” according to its website, gives students the opportunity to see firsthand how government works. While at the conference Harvard Model Congress members participate in various debates and committee work for which they have previously prepared. Students from RHS attended the Boston branch of the conference. Other Harvard Model Congresses take place in San Francisco, Rome, Seoul, Dubai, and São Paulo. “My favorite part of the conference probably was being able to cooperate and debate with kids from all over the world with different backgrounds from myself over popular controversial topics and issues,” says RHS senior and two year HMC member, Matt Kirslis. 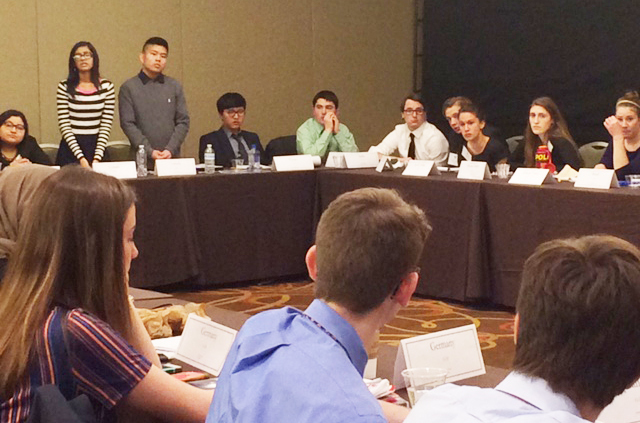 Prior to attending the event in Boston, students prepared in weekly meetings with each other and their advisors. “We have weekly meetings throughout the year to help prepare students for the conference,” says RHS senior and RHS HMC President, Zach Pransky. After practicing and fundraising during the summer and throughout the school year, students were fully ready for the conference. Not only do students have a great time at the conference with their classmates, they are also able to learn valuable life lessons while learning more about themselves. From a senior’s point of view, some students have been able to clarify what they hope to achieve in their future. Sara Bistany, also an RHS senior and two year HMC member agrees with Pransky. Kirslis has also taken away some valuable points from the conference.